Traveling with a child can be a tad challenging… or super stressful and frustrating. I haven’t made any long trips with my daughter since she was a toddler (tips for traveling with a toddler here! ), but I am excited to take a trip with her now that she’s 5! I’m definitely expecting less of the crying and overtired screaming (knock on wood), but I know I will still need to bring things to occupy her and keep her happy. 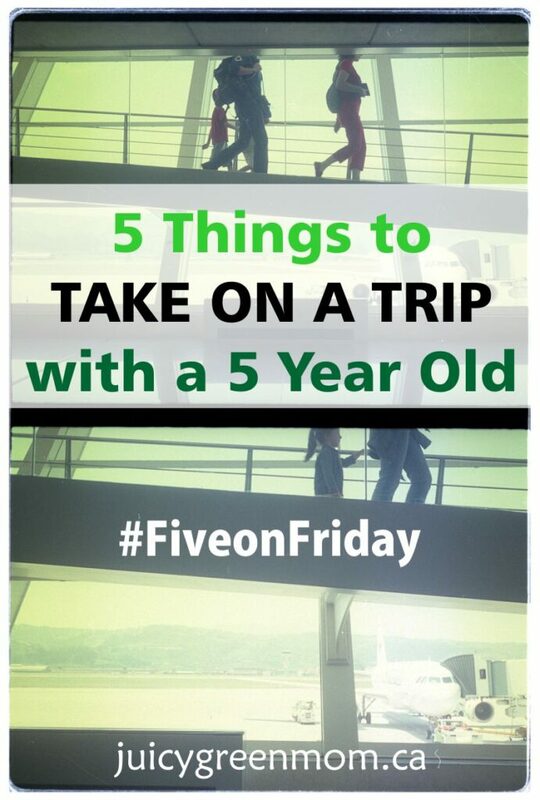 So here’s my list of things to take on a trip with a 5 year old for today’s Five on Friday post! Even though you can’t bring a full water bottle, buying some water after you get through security to fill up your kid’s bottle is a good idea. Thinking ahead to the plane ride, the ascent and descent may annoy your kid’s ears, and sucking (which works if you have a straw bottle) can help equalize the pressure in their ears. And water keeps them hydrated, of course! Depending on your child, a colouring book may not cut it. My kid loves doing different ACTIVITIES, so I have to be sure not to get something with only pictures to colour. She is really into Chirp magazines, so I may also get a kids magazine at the airport. Sticker activity books can be great as well. Think carefully about this one – because you need to weigh your child’s preference for crayons, pencil crayons, and markers, along with their functionality. Markers are often the favourites, but if your kid isn’t great at putting caps back on, or flicks them off the plane tray table… they could lead to some very annoying situations. If you decide on pencil crayons, you’ll also need a pencil sharpener! This set of multi-functional woody crayons would be perfect! We got some kids headphones that limit the volume so that they can’t cause any hearing damage – a super important feature for me! These are perfect for plugging in on the plane if they have TV or movies, and also for bringing an iPod or tablet. My daughter loves listening to music and it helps her sleep on the plane! Snacks are a necessity, and though you can certainly get the at the airport, it’s nice to have some good familiar (and hopefully less junky) ones on hand. They’re also great to pull out during the ascent and descent because the chewing motion can also help “pop” the ears if your child is bothered by it. Some of my staples are dried cranberries, Mary’s Organic Crackers, and Prana’s Kilimanjaro organic deluxe chocolate trail mix. What are your travel essentials when traveling with kids?